An attractive and well proportioned upper maisonette over the top two floors of this three storey building. It has its own entrance and a rare roof terrace, both south facing and sheltered, which runs off the kitchen with a lovely outlook across gardens at the back. 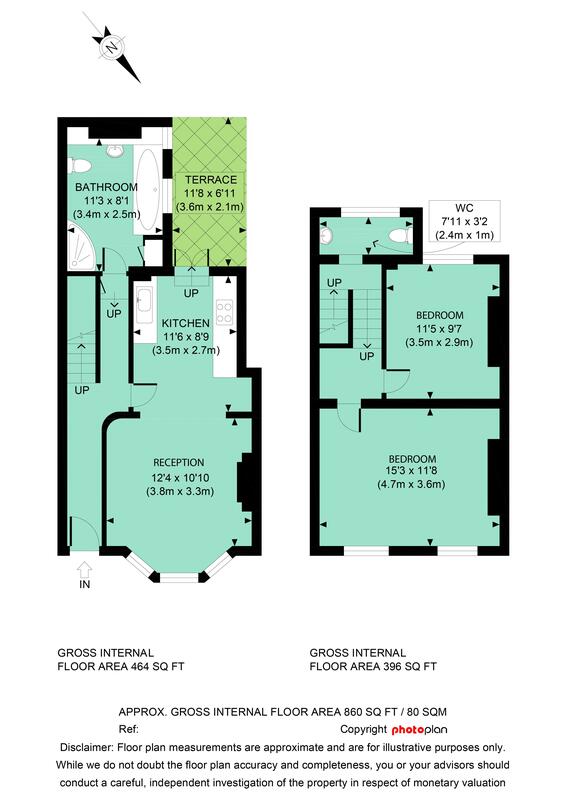 The garden flat below this flat is currently available so acquisition of the entire freehold building is possible, thus offering a wide range of options to a buyer. The property is located just off Askew Road on the west side - here Askew Crescents south facing gardens adjoin those of St Elmo Road and create a surprisingly peaceful oasis that can be enjoyed from the terrace of this flat. It is minutes from the local shops, restaurants and bus routes on Askew Road and Uxbridge Road as well as being nearby to Westfield. Ravenscourt Park (District Line Tube), and further Shepherd's Bush (Central,Circle and Hammersmith & City Line Tubes) are also all close at hand. 860 sq ft / 80 sq m approx.